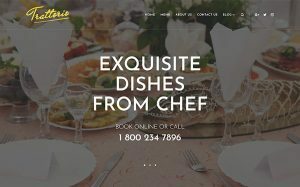 Why Premium Restaurant Templates are a Worthy Investment? WordPress is a blogging platform per se. It became so popular and universal partly due to its trouble-free scale-ability. WordPress webmasters always knew the best tools out there. Laymen with an ambition to power their own websites had to plunge into Plugin Market and take any chances. 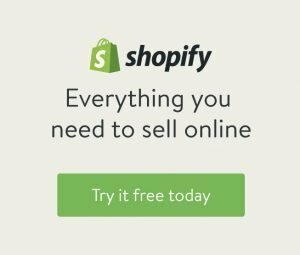 Creating your website in 2018 for the first time, you’re a fortunate one. On top of the professional design, you get a pack of all the tools you need for powering a professional web presence within a comprehensive and user-friendly environment. 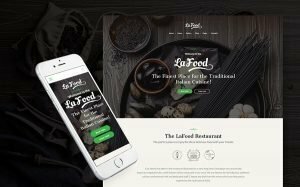 What You Get With a Premium Restaurant WordPress Theme? Ready-made search engine optimization by experts. You get a head start over your competitors as the coding of theme files is built the way your keywords taste crawlers best. A builder for drag-n-drop editing. For years, clients dream of such a tool getting through coding their pages in HTML as the default WordPress editor constantly messed up. You’re a fortunate one! Additional set of custom User Interface elements that you can use within the builder. Called modules, they create complex content blocks (accordions, carousels, tables, tabs and more) based on your preferences. Professional niche-related plugins that boost user experience and conversion. To tell the truth, you’ll find a lot of other neat extras in every theme. 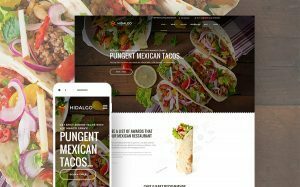 So, let me present you the outstanding items that made it to our fresh list of top restaurant WordPress themes. Have fun! 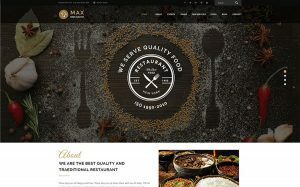 Quality Meals is a feature-rich launching pad for a classy appetizing restaurant website. It has a thick pack of first-rate plugins that you get absolutely free. First of all, Visual Composer empowers new-gen visual website editing in two modes: Frontend & Backend. Moreover, you get a second editor on top of this: Live Customizer. You’ll need it while you tweak setting and styles of different site elements as it lets you preview changes live. Among other Quality Meals draws, we can’t pass on the handy MailChimp Newsletter integration, extended typography control and high-quality left-to-right language support. BeTasty is a template that captures with gourmet UI, that’s additionally enhanced with immersive Parallax backgrounds and trendy image hover animations that trigger clicks. Reserving a table online with BeTasty will turn into a preferred option for your clients. While booking online they get a chance to choose a table on an interactive table map that shows which tables will be free for the chosen time span. Another delectable UX-booster of BeTasty is the Restaurant Menu plugin. It helps you build client-oriented menus that cover ingredients, portion sizes, nutritional data, etc. 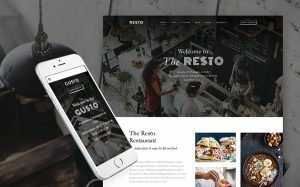 This responsive template is the one that’s designed to reflect the gist of the pace, the atmosphere of it and uncover the uniqueness of experience that awaits your guests. Its high-quality design can be fine-tuned using a lightning-fast visual content creator, i.e. Elementor Builder. This builder makes it easy to add content of different types and customize it with intuitive drag-n-drop. And that’s not the whole story. Trattorio creators also bring you 4 alternative blog layouts, ready-made footer variations, JetElements pack, MegaMenu plugin and more. 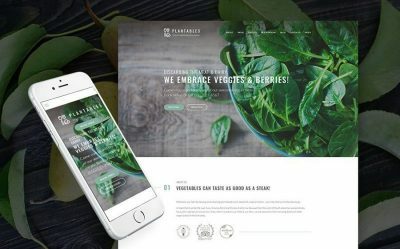 If you want to find a restaurant template that spotlights 2018 web design trends, take a closer look at Cuisinette. It makes a lasting impression by using a charcoal black hero image that falls in line with the dominant 2018 color preferences. To increase user engagement, the template’s scrolling experience is enhanced with intricately animated imagery, Parallax backgrounds, and microinteractions-enhanced gallery section. What’s more, the theme comes with an enviable pack of user experience boosters, including WordPress Social Login, Cherry Socialize, Jet Menu and other plugins. 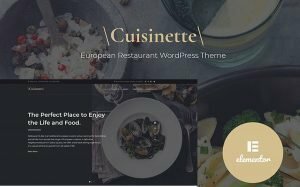 Additionally, Cuisinette template is fully compatible with well-loved WooCommerce and hassle-free Ecwid plugins, which both help you turn your WordPress site into a fully functional e-store. Drive special attention to your bistro, cafeteria, wine shop or restaurant with the state-of-the-art Degusto theme. It brings together charming backgrounds, hot font combinations, minimalist layouts and hand-crafted icons to relate the dynamic, yet relaxing atmosphere of your place. Thanks to a set of UI-boosting plugins, you’ll get a chance to tell your story, present your team and explain the amenities you offer within a tailor-made interface that beats the conventional ones. No doubt, the powerful Menu plugin, as well as user-friendly Table Booking extension, are both included for an invincible user experience. 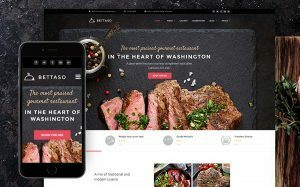 Similar to other top 2018 restaurant WordPress themes, Degusto guides you by hand through site customization with easy-to-grasp Power Page builder interface and intuitive WordPress Live Customizer. iVeggi theme is designed for a place that serves meals based on natural ingredients, such as vegetables, berries and herbs. It uses different types of posts to explore vegetarian cuisine in all the possible ways. If you check out the template’s Live demo, you’ll immediately see how successfully this theme utilizes broken grid layouts to create an intricate and tempting mosaic of your Menu categories. At the same time, you’re free to modify these layouts up to your liking in a comprehensive drag-n-drop interface of the lightning-fast Elementor builder. Refined and delectable, the Letizia theme enshrines the best traditions of Italian cuisine. It creates a place where cooking is treated as art and gives food not only to our body but to the mind as well. Fortunately, splendid design and pioneering features of this template come in line with its comprehensiveness. 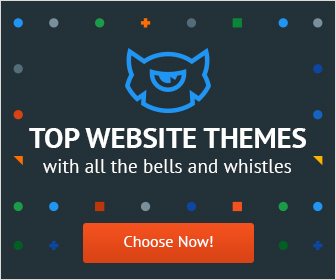 The theme installs seamlessly within 5 minutes with its high-quality sample imagery that you may use as a bonus. And it already has Power Page builder on board to let you enjoy hustle-free website personalization. Fortunately, flawless adaptive qualities of the template make breaking its display on tablet or smartphone screen next to impossible. If you know the gist and the true notion of the word ‘delicious’, this theme lets you show your expertise and apprehension. Delicia template combines full-scale background images with Parallax effect, achieving a mosaic of inspiring images and well-structured content parts. The theme features well-thought CTA buttons, the one of which resides in the website’s header and invites to book a table right away. Fortunately, you don’t need any prior website management experience to personalize the template. With Power Builder editor, you can save your time on customizing the website with a library of presets, a number of pre-made header and footer styles and content modules for any purpose. Flamboyant design of this Mexican restaurant theme excites our senses with the abundance of color and detail. It draws people in with appealing menu swatches, animated imagery and playful backgrounds. Cuaquero theme brings you rich social sharing and promotion opportunities, table booking functionality, lead-minded newsletter subscription form and many other much-needed extras. Thanks to advanced Restaurant Menu plugin, you can create an exhaustive online menu of your restaurant with no hassle. Then, add it to posts, pages or sidebars the way you prefer. 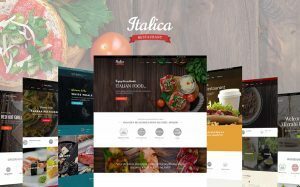 If you don’t feel like being limited to one design for your website, Italica theme bundle will please you with a number of skins. It features designs for Italian, seafood, kosher, fast food restaurants and other places to eat out. You won’t be lost managing the skins, as the template is equipped with a visual editor that lets you take control over every block of your website. Thanks to pre-built Appointment Booking plugin, users can book a table by choosing the date and the time slot that best matches their schedule. Moreover, underpinned by valid coding by professionals, Italica theme provides for sky-rocketing on SERPs after website’s launch. 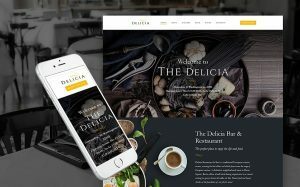 We hope that you enjoyed this gourmet web design selection of the most advanced restaurant WordPress themes 2018. Was able to find the right theme for your restaurant/catering business? Then, grab it, go live and reach and become one of the best in the game! You can also read a next review on Templates built with Bootstrap here.